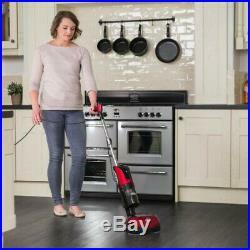 Ewbank Floor Polisher Scrubber Vacuum 23 ft. Power Cord Interchangeable Pads. Floor Care Features: No Additional Features. Included Accessories: No additional accessories included. 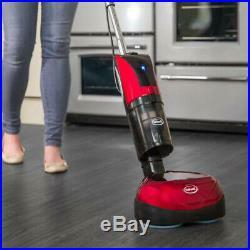 The Ewbank EPV1100 4-in-1 Floor Cleaner, Scrubber, Polisher and Vacuum delivers a complete floor cleaning solution. The EPV1100 is suitable for all floor types, including laminate, wood, vinyl, marble and granite. 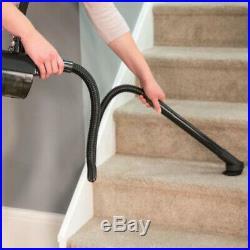 The easy to maneuver design is perfect for living rooms, kitchens and other medium to large spaces. 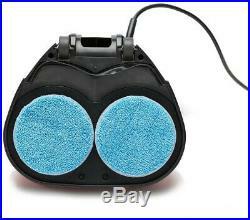 Constructed of high impact material that is built to last, the polisher cleans and polishes a 9.5 in. Path and delivers 2,200 rpm on the contra-rotating discs that are capable of cleaning, scrubbing and polishing your hard floors to a beautiful shine. 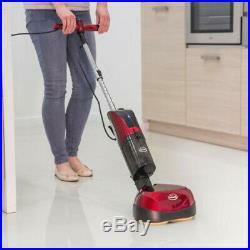 The cyclonic vacuum detaches from the polishing unit for vacuuming hard floors before or after polishing. Long power cord provides extra mobility. 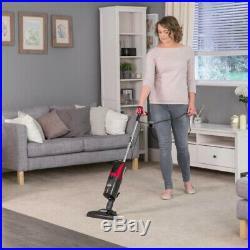 Other features include a 780-Watt Cyclonic Bagless HEPA Vacuum Filter, onboard cord storage area, telescopic handle and a butterfly grip for extra stability. The EPV1100 includes (2) nylon bristle scrubbing brush plates, (2) hook and loop backing plates and (3) pairs of interchangeable and reusable microfiber cleaning and polishing pads and (1) vacuum head, to keep your natural floors looking beautiful. The EPV1100 is non-damaging to delicate floors. Cleans, scrubs, polishes and vacuums in 1 great machine. 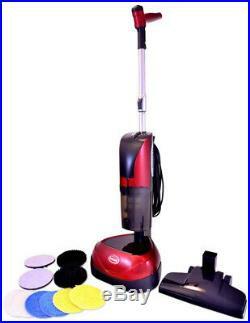 Detachable body to change from polisher and vacuum to vacuum only in seconds. Suitable for all floor types including laminate, wood, vinyl, marble and granite. Includes a full range of interchangeable and reusable pads for any cleaning need. These products are manufactured according to the specifications of the US Electrical Standards and codes. We assume no responsibility if the item malfunctions or causes an accident because you tried to use the product with foreign electrical standards. The Use with a converter or other voltage transforming device is at your own Risk. Please Note: Products are designed and rated for use in the US using 120 volt current. With or without a transformer, this product is not recommended for use outside the US. Customer service is our top priority! Please be sure to read the description thoroughly to make sure that this is the item you want before making a purchasing decision. We make every effort possible to accurately describe and depict the items. Please be aware that slight variations in color may be due to differences in lighting and computer monitor resolutions. Thank you for shopping with us. We appreciate your business! If ordering electrical items outside of the U. Please note that they will come equipped with a standard U. You will need a suitable adapter to use the item in your country. An adult signature will be required. Please be sure to have available help on hand to assist you with moving the item to the desired location in or outside of your home. Only factory defects are accepted as a reason for a return. In the case of factory defects, if available, we will replace the product for you. When returning an item, it must be in all of the original packaging and include all of the original accessories or items that came with it. The item and package should be in original and perfect condition. We do our best to process as quickly as possible. Orders are processed immediately and dispatched to fulfillment as soon as they are received. For this reason, we are typically unable to honor cancellation requests. If the order has gone too far through the fulfillment process, we will be unable to cancel. Listed by Sku Fetch. The item “Ewbank Floor Polisher Scrubber Vacuum 23 ft. Power Cord Interchangeable Pads” is in sale since Thursday, April 11, 2019. 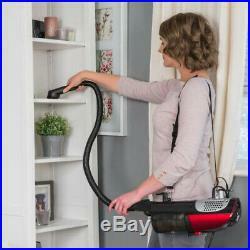 This item is in the category “Home & Garden\Household Supplies & Cleaning\Vacuum Cleaners”. 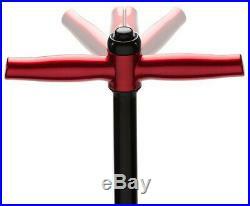 The seller is “hmfreedom” and is located in Miami, Florida. This item can be shipped to United States, Canada, Denmark, Romania, Slovakia, Bulgaria, Czech republic, Finland, Hungary, Latvia, Lithuania, Malta, Estonia, Greece, Portugal, Cyprus, Slovenia, Japan, China, Sweden, South Korea, Indonesia, Taiwan, South africa, Thailand, Belgium, France, Hong Kong, Ireland, Netherlands, Poland, Spain, Italy, Germany, Austria, Bahamas, Israel, Mexico, New Zealand, Philippines, Singapore, Switzerland, Norway, Saudi arabia, Ukraine, United arab emirates, Qatar, Kuwait, Bahrain, Croatia, Malaysia, Brazil, Chile, Colombia, Costa rica, Dominican republic, Panama, Trinidad and tobago, Guatemala, El salvador, Honduras, Jamaica, Antigua and barbuda, Aruba, Belize, Dominica, Grenada, Saint kitts and nevis, Saint lucia, Montserrat, Turks and caicos islands, Barbados, Bangladesh, Bermuda, Brunei darussalam, Bolivia, Ecuador, Egypt, French guiana, Guernsey, Gibraltar, Guadeloupe, Iceland, Jersey, Jordan, Cambodia, Cayman islands, Liechtenstein, Sri lanka, Luxembourg, Monaco, Macao, Martinique, Maldives, Nicaragua, Oman, Peru, Pakistan, Paraguay, Reunion, Viet nam, Uruguay.